A crisp and buttery homemade lemon biscuit. "Loved the homemade aesthetic. A touch more lemon would have got it full marks for taste." "I really enjoyed the slender width of the biscuit." "Liked the hint of lemon, it cleansed the platae beautifully." "Delicious biscuit. Crunchy, buttery, lemony - great news. 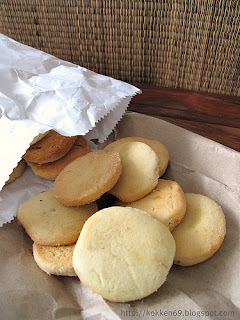 If I'm going to be picky I would have liked more lemon - but it really was a great biscuit." "Really enjoyed this biscuit. Beautifully conceived - a delicate biscuit that smacks of real class." "A very high benchmark has now been set. I'm not quite sure how such perfection can be followed."